The N4350 is essentially a four bay version of the entry-level N2350 I reviewed last year. Using Thecus' comparison generator, I created the chart below to compare the N2350 and the N4350. As you can note, the N4350 has a slightly more powerful processor than the N2350. Both NASes have support for iSCSI target and initiator - a feature that you rarely see in NASes at all, let alone low-end models. For this review, I decided to compare the performance of the Thecus N4350 with the QNAP TS-431P. Thecus's $269 price for the N4350 puts just slightly above the $265 QNAP TS-431P. The chart below, generated from our NAS Charts, compares the major features of the TS-431P and the N4350. Both NASes have dual-core processors and both feature 1GB of non-upgradeable RAM. However, the QNAP TS-431P has dual gigabit Ethernet ports along with failover, load balancing, and link aggregation. In addition, the QNAP TS-431P has three USB 3.0 ports including one on the front panel. The N4350 only has two USB 3.0 ports - both located on the rear panel. You can see the full feature comparison here. The callouts below show the front and rear panels of the N4350. The front panel features lockable disk trays - a feature rarely found on entry-level Home/SOHO NASes. There is a USB copy button located near the power switch, but there isn't a convenient USB 3.0 port located on the front panel. The front panel callouts also show how individual LEDs indicate status. The rear panel has a single gigabit Ethernet port, two USB 3.0 ports, power connector, cooling fan vent and a reset button. Not labeled in the callouts is a security cable slot located on the right side of the case rear. The board photo below shows the component side of the N4350's main PCB. The CPU is located beneath the large heat sink, and the riser card connector for the drive bay backplane is located at the upper right-hand corner of the board. Here's the similar N2350 board for comparison. The table below shows the key component summary for the two NASes compared in this review, plus the N2350. Note the N4350 uses a different processor than the N2350. The N4350 drew 18 W with four of our stock WD Red 1 TB (WD10EFRX) spun up and 9 W in power save mode with the drives spun down. Fan and drive noise was generally very low. However, the fan would occasionally briefly audibly spin up when the system was under load. RAID build time with Quick RAID was ~ 5 minutes for any volume format. 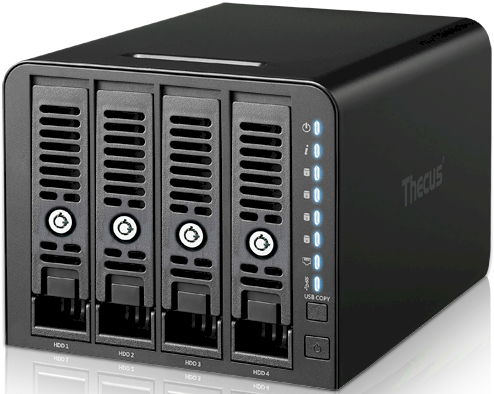 Like most other NAS manufacturers, Thecus has a common operating system for its NASes. The current operating system is ThecusOS 7. You can download the complete 160 page OS7 User's manual here. The screenshot below shows the N4350 desktop. The control panel allows you to configure the N4350. The Thecus website has a link to a live demo for ThecusOS 7. The linked page includes credentials for the Admin account and a user account. Both are read-only. I clicked on the Live Demo link and it took me back to the parent ThecusOS7 page, so apparently, the live demo feature isn't currently working. Like most other NASes, Thecus provides a library of applications that can run on your NAS. However, Thecus' app library is very small, offering only the 13 apps shown below. Of course, not all applications will run on entry-level NASes. Notable apps include the Plex and Twonky media servers and surveillance system for use with IP cameras. Firmware version 3.02.02.11.a388 (Thecus OS7) was loaded onto the N4350 and performance tests were run using the Revision 5 NAS test process. All tests were run using Western Digital Red 1 TB WD10EFRX (x4 SNB supplied). Note: While the N4350 supports both the EXT4 and the XFS filesystems, all tests were run using EXT 4. With the exception of the RAID 0 File Copy Read test, all of the File Copy Read and Write tests for the N4350, as well as the QNAP TS-431P, were in excess of 100 MB/s. We noted the same lower performance for RAID 0 File Copy Read when we reviewed the N2350 last year. In general, the TS-431P outperformed the N4350 on virtually every test with the exception of Network backup and NASPT Content Creation for all RAID levels. The N4350 had an exceptionally speedy network backup throughput of 101.4 MB/s compared the TS-431P's 36.6 MB/s, which is more typical for this benchmark. The chart below shows the Total NAS scores for the seven least expensive two-bay RAID 1 NASes. The Thecus N4350 has a Total NAS ranking of #9 compared to the #4 ranked QNAP TS-431P. The performance summaries below show the QNAP TS-431P outperformed the Thecus N4350 in every category except Mixed Read Write and Backup. In the Mixed Read Write category, the QNAP's scores were dragged down by its lower throughput on content creation as noted above. Similarly, relatively poor Network Backup dragged the QNAP's Backup category score down even though the USB3 NTFS backup throughput for the QNAP was almost twice as fast as the Thecus' throughput. We often present our NAS Ranker table sorted by price rather than by rank because it makes it easier to spot a good value. If a NAS is cheaper but has a higher ranking, it's probably a pretty good deal. In this case, the slightly cheaper #4-ranked QNAP TS-431P has a clear edge over the #9-ranked Thecus N4350. If you're looking at mid-range priced 4-bay NASes, the QNAP TS-431P, with dual Ethernet ports and a third USB 3.0 port, is a clear choice. About the only reason to consider the N4350 is if you want both iSCSI target and initiator. As the N4350's #9 Total NAS ranking indicates, it performs very similarly to the #10-ranked ASUSTOR AS1004T, but the ASUSTOR NAS is $70 cheaper.